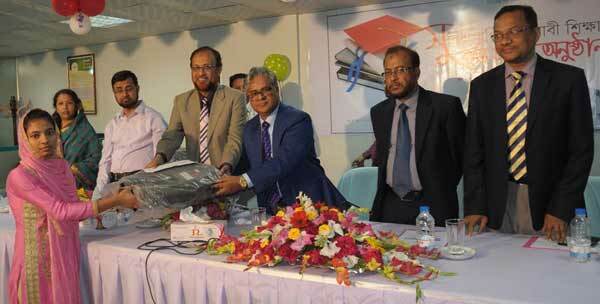 Chittagong, Bangladesh (BBN)-Islami Bank Bangladesh Limited awarded scholarships to eighty two underprivileged meritorious students of thirty four colleges of Chittagong region, southern part of Bangladesh. Mijanur Rahman Joddar, Executive Director, Bangladesh Bank, Chittagong handed over the scholarship money and educational instruments to the students at a function in Chittagong recently as the chief guest. Presided over by Mohammad Amirul Islam, Executive Vice President & Head of Chittagong South Zone of the bank. Professor Mohammad Sana Ullah, Principal, Satkania Govt. College, Tahureen Sabur, Principal, Enayet Bazar Women College, Mohammad Abu Yousuf, Principal, Rangunia College, Md Rafique Uddin, Principal, Rangunia College as special guest, among others, were present in the occasion. Md Mostafizur Rahman Siddiquee, Executive Vice President & Head of Chittagong North Zone of the bank delivered welcome speech in the program. Mentionable that Islami Bank is providing scholarships to some 1500 under prevailed meritorious students in 2015 under its CSR activities.